Gameboy guru Gijs Geikes rocks LSDJ with workshop participants, and even the mysterious interface of this tracker-style instrument for Nintendo systems can capture audiences’ imagination. Gijs has just posted some photos of his workshops in action, complete with sample MP3s and (best of all) some great tips for making sounds with LSDJ. Click the “Instruments” menu on the right for synthesis ideas and more. And yes, that’s my friend Bubblyfish at one of the workshops, so LSDJ’s “rival” Gameboy app Nanoloop makes an appearance, too. 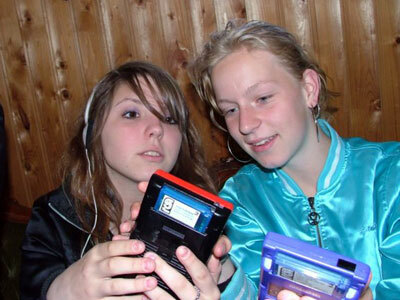 And what’s with the PSP? Emulation, baby. Though I’m sticking with my vintage Gameboys at about 3% of the price of the Sony. More news soon as I resume a normal broadcast schedule this week . . . Pro Tools HD 7 October 7?